He studied jurisprudence at the university of Cracow. In 1928 he became a pupil of Boleslaw Wallek-Walewski. 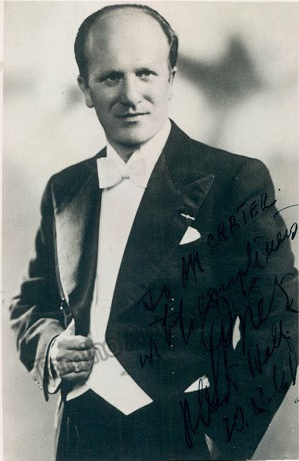 In 1938 he made his debut at the Opera Krakowska as Comprimario in ‘’Halka’’ of S. Moniuszko. He continued perfecting his vocal under the pedagogue Kniagin and with Padre Bernardino Rizzi in Cracow. During the Second World War he studied in Rome under Pesci. In 1942 he was sent to a concentration camp in Isernia. He succeeded after a bomb attack on the camp and fortunately escaped. Then he was engaged as principal tenor by the Teatro San Carlo in Napoli. Here he made his debut in 1944 as Cavaradossi in G. Puccini’s ‘’Tosca’’. In April, 1944 he joined to the Polish army forces and gave numerous concerts before allied soldiers. In 1946 he undertook successful concert tour through England and Scotland. In the 1951-1952 seasons he sang at the Gran Teatre del Liceu in Barcelona among other things as Faust, Schuiskij in ‘’Boris Godunov’’ of M. Mussorgsky and in ‘’The tale of Tsar Saltan’’ by N. Rimsky-Korsakov. In the 1956-1957 season he was engaged by the Stadttheater in Flensburg.